The last account of the First Vision to be written by Joseph Smith himself was—somewhat ironically—the first to be published. This account—written in 1842—was a part of what has become known as the Wentworth Letter. This document was initially prepared at the request of a John Wentworth—editor of the Chicago Democrat—in behalf of his friend George Barstow, who was writing a history of New Hampshire. The document Joseph Smith wrote in response covered the history of the Church up to that point, concluding with a statement about the future of the Church (the Standard of Truth) and a summary of a few basic beliefs (the Articles of Faith). Barstow never published the document, since he decided to only cover events through the year 1819 in his book, but a copy of the document was published in the Nauvoo periodical the Times and Seasons on March 1, 1842 (see Smith 437). The text was reprinted again with some slight revisions by Daniel Rupp in 1844 in a book called An Original History of the Religious Denomination at Present Existing in the United States. The Wentworth Letter, as printed in the Times and Seasons. I was born in the town of Sharon Windsor co., Vermont, on the 23d of December, A. D. 1805. When ten years old my parents removed to Palmyra New York, where we resided about four years, and from thence we removed to the town of Manchester. My father was a fanner and taught me the art of husbandry. When [I was] about fourteen years of age I began to reflect upon the importance of being prepared for a future state, and upon inquiring [about] the plan of salvation I found that there was a great clash in religious sentiment; if I went to one society they referred me to one plan, and another to another; each one pointing to his own particular creed as the summum bonum of perfection: considering that all could not be right, and that God could not be the author of so much confusion I determined to investigate the subject more fully, believing that if God had a church it would not be split up into factions, and that if he taught one society to worship one way, and administer in one set of ordinances, he would not teach another principles which were diametrically opposed. Believing the word of God I had confidence in the declaration of James; “If any man lack wisdom let him ask of God who giveth all men liberally and upbraideth not and it shall be given him.” [James 1:5.] I retired to a secret place in a grove and began to call upon the Lord, while fervently engaged in supplication my mind was taken away from the objects with which I was surrounded, and I was enwrapped in a heavenly vision and saw two glorious personages who exactly resembled each other in features, and likeness, surrounded with a brilliant light which eclipsed the sun at noon-day. They told me that all religious denominations were believing in incorrect doctrines, and that none of them was acknowledged of God as his church and kingdom. And I was expressly commanded to “go not after them,” at the same time receiving a promise that the fulness of the gospel should at some future time be made known unto me (Smith 438). The 1842 Wentworth letter is very similar in some ways to Orson Pratt’s account. I don’t know whether Joseph Smith actually used Orson Pratt’s pamphlet to draft his Wentworth letter or if there was a source document behind the two of them. I don’t know. Other folks seem more certain about that than I’m willing to be, but clearly… there is a relationship between those accounts (Harper and Topp). Whatever the case—the two accounts are similar, and the Orson Hyde account seems to be based closely on both of these accounts as well. While this account is similar to a few other contemporary accounts, it is unique among the Joseph Smith accounts for speaking of the First Vision as a vision rather than a physical experience. 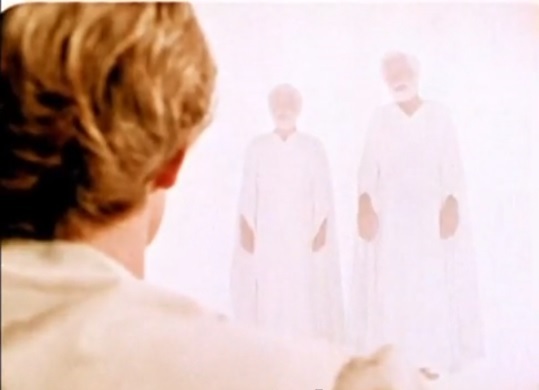 As Joseph states it, “my mind was taken away from the objects with which I was surrounded, and I was enwrapped in a heavenly vision.” This understanding could lead to a possible reconciliation of the First Vision with a statement that some anti-Mormon authors have hit upon: In Section 84 of the Doctrine and Covenants, Joseph Smith stated that “without the ordinances thereof, and the authority of the priesthood, the power of godliness is not manifest unto men in the flesh; for without this no man can see the face of God, even the Father, and live” (D&C 84:21-22). Since it seems that Joseph received what we call the Melchizedek priesthood sometime between 1829 and 1832—about nine years after the First Vision—at first glance this statement would either invalidate the First Vision or be invalidated by the vision. Looking at the Wentworth Letter account, however, we see another idea in place—that it was indeed a vision, separate from the world around him and not a literal beholding the face of God as a physical experience. Joseph was enwrapped in a heavenly vision. The other notable unique aspect in this letter is the promise that is given at the end—that, as Joseph said, “the fulness of the gospel should at some future time be made known unto me.” It is here that we have in writing a hint of his future prophetic calling—the central point that early Church leaders referred to the First Vision experience to proclaim. The fact that this is the only account written by Joseph that mentions a pending mission begs an interesting question, however—was the First Vision truly the moment that Joseph was called to the ministry? Certainly the First Vision had an important role in the Prophet’s religious identity. It outlined the need for something to happen in the religious world and confirmed a direct link between Joseph and Deity. We do not see, however, a mission given or an immediate call to action—just an interview for information. Granted, in the Wentworth Letter we are told that Joseph was promised that “the fullness of the gospel” would be revealed to him in the future, and in the 1838 “official” account, Joseph refers to himself as “one called of God” (JS-H 1:28) between the First Vision and the visit of the Angel Moroni, but there is no explicit indication of what that calling was. What event would serve as Joseph’s initial prophetic call then? The most likely candidate would be the visit of the Angel Moroni. During that interview—according to Joseph’s later record—we have Moroni telling the young prophet that “God had a work for me to do” and then relating the existence of the golden plates that would become the Book of Mormon (see JS-H 1:33-35)—indicating that Joseph’s initial prophetic call would be to translate this ancient record into a modern language. Indeed, four years later, Joseph was told by the Lord in a revelation that, “You have a gift to translate the plates; and this is the first gift that I bestowed upon you; and I have commanded that you should pretend to no other gift until my purpose is fulfilled in this; for I will grant unto you no other gift until it is finished” (D&C 5:4), giving validation to the idea that Joseph felt the translation would be his prophetic mission for the first few years. Upon inspection, we also see that the visit of the angel Moroni both spoke of and led to more action than the First Vision. Elder M. Russell Ballard—a senior member of the Quorum of the Twelve today—wrote that “instead of simply telling him [Joseph] that all was well and that God still loved him, Moroni came to put Joseph to work” (41). Richard Lyman Bushman also noted that, “If Joseph initially understood the First Vision as his conversion, similar to thousands of other evangelical conversions, this vision [of Moroni] wrenched Joseph out of any ordinary track” (44). When it comes to the level of action following the visions, there is a difference as well. After the First Vision, Joseph told at least the Methodist minister and perhaps a few other individuals about what he had saw and heard, but did little else, especially since he received such a negative reaction. As Richard Lyman Bushman noted, “the 1820 vision did not interrupt the Smith family’s round of work” (41). After the visit of the Angel Moroni, however, Joseph produced a large religious text that he claimed was scripture—the Book of Mormon—gathered believers to support and assist him in the production of this text, began to record revelations from God, and organized the Church of Christ—later to be known as the Church of Jesus Christ of Latter-day Saints. To further our examination of the subject, let us compare the 1820 and 1823 visions of Joseph Smith to the prophetic calls expressed in the Bible and other Hebraic texts. In doing so, it must be kept in mind that the culture of the prophet writing affects how he speaks of his experiences. We have discussed previously how Joseph Smith’s 1832 account of the First Vision was written in the form of a born-again narrative and Christopher C. Jones has demonstrated that even the 1838 account was influenced by the style of a Methodist conversion narratives (see Jones), indicating that the Prophet’s style was influenced by the culture he lived in. Blake T. Ostler, in writing about ancient prophetic commissions noted that, “Such theophanic experiences [experiences of visions of God] were placed anciently ‘at the beginning of the traditions of the works and words of the prophet’ as a means of providing ‘vindication and legitimization of the prophet in his office’”, which meant that “these narratives are probably not simply transcripts of what was experienced at the time. They are as well accounts designed to serve certain definite ends and they no doubt to a certain extent stylized the call” (68). All accounts of prophetic calls are influenced by the culture of the prophet in question, some aspects of which may be very symbolic, meaning Joseph’s experience will be recorded differently than Isaiah’s or Ezekiel’s experiences. We may, however, catch glimpses of what the ancient prophets truly experienced and compare it to what Joseph Smith experienced. There are two types of prophetic calls found in the Bible—the “narrative” type, which includes a dialogue with God or other divine messenger; and the “throne theophany” type, which introduces the prophetic commission with a vision of the heavenly throne of God (see Ricks 97). Both of these literary patterns also have use in apocryphal Jewish works and the revealed scriptures produced by Joseph Smith—including both the Book of Mormon and the Joseph Smith Translation of Genesis (published today, in part, as the Book of Moses). In reality, however, the throne theophany is really just a specific genre of the narrative call, so we will look at both types as one. Historical Introduction: A brief introductory remark providing circumstantial details such as time, place, and historical setting. Divine Confrontation: Either deity or an angel appears in glory to the individual. Reaction: The individual reacts to the presence of the deity or his angel by way of an action expressive of fear, unworthiness, or having been overpowered (Ostler 69). 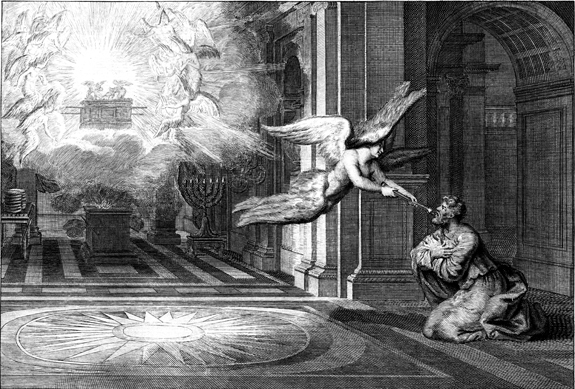 Throne-Theophany: A theophany is a vision of God, and a throne-theophany is a vision where “the individual sees the council of God and God seated upon his throne. This element distinguishes the throne-theophany commission from” the narrative call form (Ostler 70). The Introductory Word: The introductory word serves to both “arouse the attention [of the prophet]” and to “spell out the specific basis or grounds for the commission” (cited in Ricks 99). Often, the reasons for why the one called upon will serve as a prophet is explained. Commission: The individual recipient is commanded to perform a given task and assume the role of prophet to the people. Protest or Objection: The prophet responds to the commission by claiming that he is unable or unworthy to accomplish the task. This element is usually absent when the reaction element is present. Reassurance: “The deity reassures the prophet that he will be protected and able to carry out the commission.” In many occasions a miraculous sign is given to the prophet. Conclusion: “The commission form usually concludes in a formal way, most often with a statement that the prophet has begun to carry out his commission” (Ostler 69-70; see also Ricks 97). There are many great examples of the prophetic commission. To illustrate the different parts of the call, we will look at Moses’s experience with the burning bush, Jeremiah’s call, Lehi’s throne-theophany in the Book of Mormon and Enoch’s vision in the Book of Moses. Jeremiah, Moroni, Lehi and Enoch are great examples of the prophetic call patterns. The historical introduction element fills the function of establishing the time and place setting and giving certain biographical information about the prophet. For example, Isaiah’s call begins with the statement that, “In the year that King Uzziah died I saw also the Lord” (Isaiah 6:1), indicating that the vision took place at a time of “transition, crisis and import” (Ostler 74). It came to pass in the commencement of the first year of the reign ofZedekiah, king of Judah, (my father, Lehi, having dwelt at Jerusalem in all his days); and in that same year there came many prophets, prophesying unto the people that they must repent, or the great city Jerusalem must be destroyed. Wherefore it came to pass that my father, Lehi, as he went forth prayed unto the Lord, yea, even with all his heart, in behalf of his people (1 Nephi 1:4-5). In this account we have context telling the date, a little of Lehi’s history, and an indication of Jerusalem’s situation. Both of these historic introductions help set the tone and give reasons for why the prophet is going to be called. The next element in the call pattern is the divine confrontation—an often unexpected visit from Deity or one of His messengers. Moses, for example, was tending the flocks of his father-in-law Jethro when “the angel of the Lord appeared unto him in a flame of fire out of the midst of a bush…. And Moses said, I will now turn aside, and see this great sight, why the bush is not burnt” (Ex. 3:1-3). Jeremiah simply relates that “Then the word of the Lord came unto me, saying…” (Jeremiah 1:4). The Enoch text states that, “it came to pass that Enoch journeyed in the land, among the people; and as he journeyed, the Spirit of God descended out of heaven, and abode upon him” (Moses 6:26). After Lehi prays in behalf of his people, “there came a pillar of fire and dwelt upon a rock before him; and he saw and heard much” (1 Nephi 1:6). This divine confrontation describes the appearance of the Divine and is often followed by the reaction. The reaction element is an expression of unworthiness on the part of the prophet-to-be in response to being in the presence of a glorious being. Generally the reaction element or the protest elements are present, but not both. Lehi left the pillar of fire and “returned to his own house at Jerusalem; and he cast himself upon his bed, being overcome with the Spirit and the things which he had seen” (1 Nephi 1:7). Isaiah exclaimed, “Woe is me! For I am undone; because I am a man of unclean lips, and I dwell in the midst of a people of unclean lips: for mine eyes have seen the King, the Lord of hosts (Isaiah 6:5). The introductory word element of the narrative form serves to both “arouse the attention [of the prophet]” and to “spell out the specific basis or grounds for the commission” (cited in Ricks 99). Often, the reasons for why the one called upon will serve as a prophet is explained. In the burning bush experience, after the divine messenger identifies Himself as “the God of Abraham, the God of Isaac, and the God of Jacob” (Ex. 3:6), and adds, “I have surely seen the affliction of my people which are in Egypt, and have heard their cry by reason of their taskmasters…. I have also seen the oppression wherewith the Egyptians oppress them” (Ex. 3:7, 9). As a result of this, the Lord stated that, “I am come down to deliver them out of the hand of the Egyptians, and to bring them up out of that land unto a good land and a large, unto a land flowing with milk and honey” (Ex 3:8). Enoch was called due to the wickedness and unbelief of the people: “And for these many generations, ever since the day that I created them, have they gone astray, and have denied me, and have sought their own counsels in the dark” (Moses 6:28). Rather than the historical context of the call, Jeremiah was commissioned to serve as the Lord’s spokesman because of a premortal foreordination: “Before I formed thee in the belly I knew thee; and before thou camest forth out of the womb I sanctified thee” (Jer. 1:5). I saw visions of God…. And above the firmament that was over [the seraphim’s] heads was the likeness of a throne, as the appearance of a sapphire stone: and upon the… throne was the likeness as the appearance of a man…. This was the appearance of the likeness of the glory of the Lord (Ezekiel 1:1, 26, 28). Isaiah’s throne theophany was reported by him by saying, “I saw also the Lord sitting upon a throne, high and lifted up, and his train filled the temple. Above it stood the seraphims… and one cried unto another, and said, Holy, holy, holy, is the Lord of hosts: the whole earth is full of his glory” (Isaiah 6:1-3). 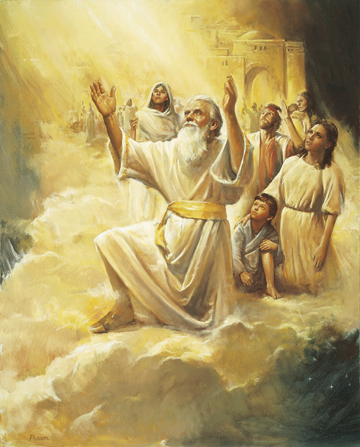 In the Lehi account, the prophet is “overcome with the Spirit” and “was carried away in a vision, even that he saw the heavens open, and he thought he saw God sitting upon his throne, surrounded with numberless concourses of angels in the attitude of singing and praising their God” (1 Nephi 1:8). Following the steps above is the actual commission of the prophet. In the case of Moses, God tells him, “Come now therefore, and I will send thee unto Pharaoh, that thou mayest bring forth my people the children of Israel out of Egypt” (Ex. 3:10). Jeremiah is told by Deity that, “I ordained thee a prophet unto the nations” (Jer. 1:5). Enoch’s commission actually comes before the introductory word, since the Lord states the commission and then offers the explanation: “And he heard a voice from heaven, saying: Enoch, my son, prophesy unto this people and say unto them—Repent, for thus saith the Lord: I am angry with this people” (Moses 6:27). Lehi’s narrative does not specifically spell out the commission, however, we see in the following chapter that, “the Lord spake unto… [Lehi], and said unto him: Blessed art thou Lehi, because of the things which thou hast done; and because thou hast been faithful and declared unto this people the things which I commanded thee, behold, the seek to take away thy life” (1 Nephi 2:1), indicating that there was a commission that Lehi set out to fulfill. After the commission is extended, the prophet generally protests his inability to fulfill his prophetic commission, hence the step known as the objection or protest. Moses initially objects to his call by saying, “Who am I, that should go unto Pharaoh, and that I should bring forth the children of Israel out of Egypt?” (Ex. 3:11) and continues from there to offer four more objections in his dialogue with the Lord. Since the reaction element is present in Lehi’s call, the protest element is absent. Jeremiah, however, objects that, “Ah, Lord God! Behold I cannot speak: for I am a child” (Jer. 1:6), and, similarly, Enoch states that he was “but a lad, and all the people hate me; for I am slow of speech; wherefore am I thy servant?” (Moses 6:31). In response to this objection, God reassures the prophet that He will aid him in their commission. To Moses, He states, “Certainly I will be with thee” (Ex. 3:12), indicating that Moses will not face Pharaoh on his own power, but will have divine assisatnace. To Jeremiah, the Lord states, “Say not, I am a child: for thou shalt go to all that I shall send thee, and whatsoever I command thee thou shalt speak. Be not afraid of their faces: for I am with thee to deliver thee, saith the Lord” (Jer. 1:7-8). To Enoch, God’s response contains both command and reassurance: “Go forth and do as I have commanded thee, and no man shall pierce thee. Open thy mouth, and it shall be filled, and I will give thee utterance…. Behold my Spirit is upon you, wherefore all thy words will I justify; and the mountains shall flee before you, and the rivers shall turn from their course” (Moses 6:32, 34). Lehi is visited by a glorious being who gave the prophet a book that fills him with the Spirit of the Lord as he reads (1 Nephi 1:10-12). He learns from this book that whatever efforts he puts into his commission those at Jerusalem will reject his message and be destroyed, however, he knows that the Lord promises protection to his servant, as Nephi reminds us with his comment that God “is mighty even unto the power of deliverance” for those who will do His will (1 Ne. 1:20). Often, to leave a token of and to guarantee the commission, God give the prophet a sign. Moses is told that he and the children of Israel would “serve God upon this mountain” (Ex. 3:12). After more objection is offered, his hand is made leprous and then healed again, and (after yet more objections are offered), Moses is given a rod “wherewith thou shalt do signs” (Ex. 4:17). God touches Jeremiah’s mouth, and says, “Behold, I have put my words in thy mouth” (Jer. 1:9). In the case of Enoch, God tells him to “anoint [his] eyes with clay, and wash them” (Moses 6:35). After this was done, Enoch “beheld the spirits that God had created; and he beheld also things which were not visible to the natural eye” (Moses 6:36; see Ricks). Finally, there is the conclusion­—the formal ending of the call, often concluding words from the divine spokesman or a statement that the prophet has begun his work. Jeremiah relates that the Lord concluded his call by stating, “see, I have this day set thee over the nations and over the kingdoms, to root out, and to pull down, and to destroy, and to throw down, to build, and to plant” (Jer. 1:10), while the Lehi account just simply states that “after the Lord had shown so many marvelous things unto” him, he went out and “began to prophesy and to declare unto them [the Jews] concerning the things which he had both seen and heard” (1 Nephi 1:18). Enoch’s account simply states that “it came to pass that Enoch went forth in the land, among the people… and cried with a loud voice, testifying against their works; and all men were offended because of him” (Moses 6:37). All of these elements form the prophetic call narrative of Hebrew literature. How well do Joseph Smith’s accounts of the First Vision and Moroni’s visits line up with the prophetic call narrative form? Let us break them down and discuss each element. The Historical Introduction: The background given by Joseph Smith of his childhood and—more importantly—the religious excitements of the Second Great Awakening around his home serve as the best historical introduction for his prophetic calling. Great care is taken to outline the divisions and contentions among them as well as his own internal conflicts that came as a result of the strife he saw around him, indicating the timeframe and the need for a prophet prior to his First Vision. We do not get as strong of a historical introduction for the visit of Moroni, other than a date, the fact that he made a few poor choices after his previous experience and felt like he needed to receive confirmation of his worthiness. The Reaction: We don’t see a strong reaction from Joseph, other than, perhaps, speechlessness, since he states that it took him a minute to “get possession of myself, so as to be able to speak” (JS-H 1:18) during the First Vision. Prior to the First Vision, Joseph had a concern with salvation, stating that, “I became convicted of my Sins… and I felt to mourn for my own Sins” (Jessee 3), however, this was not a reaction to the divine confrontation, but a part of what drove him to pray in the first place. Similarly, in the Moroni experience, Joseph prayed because he “frequently fell into many foolish errors, and displayed the weakness of youth, and the foibles of human nature” (JS-H 1:28). He went on to say, “In consequence of these things, I often felt condemned for my weakness and imperfections….. [and] I betook myself to prayer and supplication to Almighty God for forgiveness of all my sins and follies” (JS-H 1:29). 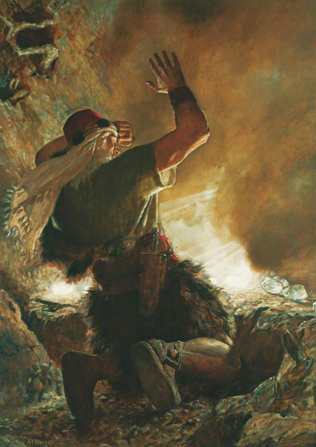 One difference for this latter vision, however, was that Joseph had already experienced the First Vision and felt particularly condemned because his choices were “not consistent with that character which ought to be maintained by one who was called of God as I had been” (JS-H 1:28), almost serving as a delayed reaction to the First Vision. Throne Theophany: Joseph’s calls seem to fit more in the basic narrative form than a throne-theophany, thus this element is absent. On a side note, however, we do see a throne theophany in the 1832 vision of the Degrees of Glory (often called “the Vision”—see D&C 76:19-24). The Introductory Word: following the initial divine confrontation of the First Vision, the Lord spoke to Joseph, calling him by name, and stating in reference to the second personage, “This is my beloved Son. Hear Him!” (JS-H 1:17). Joseph was forgiven of his sins, and in response to Joseph’s question about which church to join, he was told, “That I must join none of them, for they were all wrong… [and] that those professors were all corrupt” (JS-H 1:19), and that “all religious demoniations were believing in incorrect doctrines, and that none of them was acknowledged of God as His Church and kingdom” (Smith 438). This statement would spell out the specific basis for Joseph’s commission—to found a Church that did teach correct doctrines, etc. 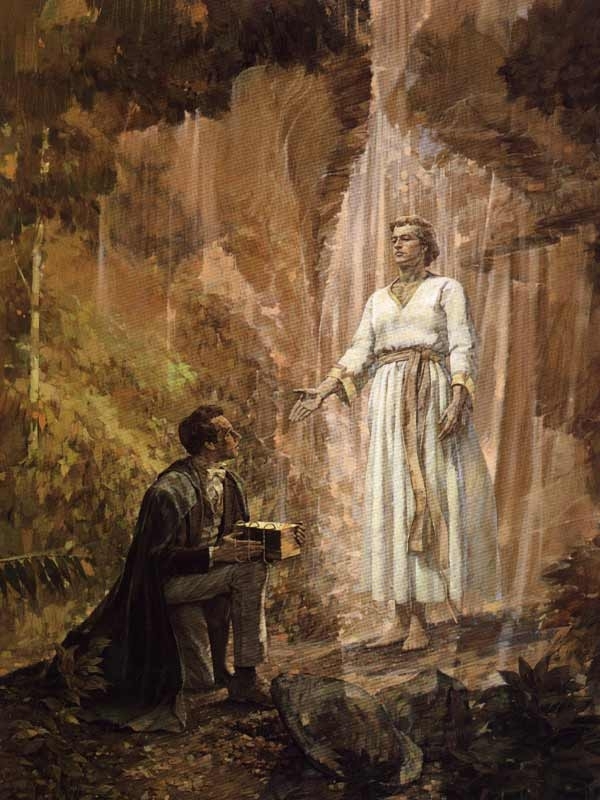 In relation to the visit of Moroni, Joseph recounts that the angel, “called me by name, and said unto me that he was amessenger sent from the presence of God to me, and that his name was Moroni; that God had a work for me to do; and that my name should be had for good and evil among all nations, kindreds, and tongues, or that it should be both good and evil spoken of among all people” (JS-H 1:33) and that “I was chosen to be an instrument in the hands of God to bring about some of His purposes in this glorious dispensation” (Smith 439). This statement outlined the purpose of the angel’s visit and the fact that Joseph would be called as a prophet. The Commission: As mentioned previously, the First Vision contains no explicit commission. The need for a prophet is explained, however, there is no statement of requirements for action in the near future, only a promise that “the fullness of the gospel” would be revealed to Joseph at a later date (Smith 438). In comparing Joseph’s records with the Lehi narrative, we do see that the ancient prophet’s call wasn’t explicate either (probably due to Nephi’s editing), however we see action afterwards resulting from his commission. There is little immediate action from Joseph’s call, as previously mentioned. In the case of the Moroni visit, however, we see that Joseph is told about a “book deposited, written upon gold plates… [and] the fullness of the everlasting Gospel was contained in it” (JS-H 1:34). Further, Joseph was told where to get it and given instructions about how to live after he had the plates (see JS-H 1:42). The next day, Joseph began to visit the place the plates were located and received instruction from heavenly messengers. The plates themselves formed the foundation of Joseph’s early prophetic career. Protest or Objection: Joseph’s accounts do not mention any protests or objections after the message of each vision was given. Reassurance: As discussed in the reaction section, Joseph went into both vision experiences feeling condemned for his sins. In the First Vision experience, he was told by the Savior, “Joseph [my son] thy Sins are forgiven thee. Go thy [way] walk in my Statutes and keep my commandments behold I am the Lord of glory I was crucifyed for the world that all those who believe on my name may have Eternal life” (Jessee 4). During the Moroni visit, Joseph was informed that God had forgiven his sins as well (see Smith 57). Neither of those statements were directly related to the Lord’s support in his prophetic calling. We find, however, that Moroni informed Joseph that there were seer stones that “God had prepared… for the purpose of translating the book” stored along with the gold plates (JS-H 1:35), indicating that Joseph would not perform the translation on his own power, but would have divine assistance. 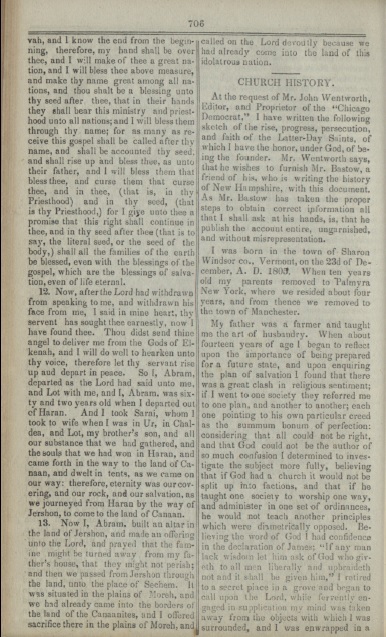 The Conclusion: In the 1838 account of the First Vision, we have a final reminder from the Lord that Joseph was not to join any of the churches, the closing of the vision and Joseph returning home and telling his mother that Presbyterianism is not true, which serves very well as the conclusion to that account (JS-H 1:20). In the case of the Moroni visit, we have the disappearance of the messenger followed by repeated visits, the angel commanding him to tell his father about the visions, and the visit to the Hill Cummorah, indicating that he began his work with the Book of Mormon, serving as an effective end to the initial visits of the Angel Moroni. Both the First Vision and the visit of the angel Moroni feature many of the aspects of the traditional prophetic call. The First Vision is stronger in the earlier aspects of the prophetic call—the historical introduction especially—and both contain a divine confrontation, while the Moroni accounts leave us with a stronger sense of the commission and reassurance for the Prophet. Another option is presented by this observation—perhaps the two visions work together to form Joseph Smith’s prophetic commission in two parts. After all, Lehi had the vision with the pillar of fire (which is, interestingly enough, how Joseph described the pillar of light on several occasions) and then went home to his bed where he had the throne-theophany experience. Perhaps the First Vision served much as the pillar of fire experience did for Lehi—the first half of his commission—and the nighttime visit of Moroni to Joseph’s bedroom corresponded to Lehi’s dream upon his bed, just with a longer time gap between the two parts in Joseph’s case. In that light, the feelings of condemnation for his lifestyle that led to the prayer prior to the Moroni appearance could fit very well into the reaction category of the narrative form, with the message of forgiveness and the divine aids that would be given forming the reassurance. Since the prophetic call would be regarded as two divine confrontations, that step, the historical introduction, the introductory words, and the conclusions would be duplicated with the stronger histrocial introduction being vested in the first vision and the stronger conclusion resting in the latter vision. The commission, meanwhile, would be specific to the Moroni visit. For a final comparison, we will use the basic format compared to Lehi’s vision to show how they would line up. Historical Introduction “It came to pass in the commencement of the first year of the reign of Zedekiah, king of Judah… there came many prophets, prophesying unto the people that they must repent, or the great city of Jerusalem would be destroyed. Wherefore it came to pass that my father, Lehi, as he went forth prayed unto the Lord, yea, even with all his heart, in beahlf of his people” (1 Nephi 1:4-5). “Some time in the second year after our removal to Manchester, there was in the place where we lived an unusual excitement on the subject of religion…. During this time of great excitement my mind was called up to serious reflection and great uneasiness; but though my feelings were deep and often poignant…. At length I came to the conclusion that I must either remain in darkness and confusion, or else I must… ask of God…. So, in accordance with this, my determination to ask of God, I retired to the woods to make the attempt. It was on the morning of a beautiful, clear day, early in the spring of eighteen hundred and twenty” (JS-H 1:5, 8, 13, 14). Divine Confrontation And it came to pass as he prayed unto the Lord, there came a pillar of fire and dwelt upon a rock before him; and he saw and heard much (1 Nephi 1:6 “I saw a pillar of light exactly over my head, above the brightness of the sun, which descended gradually until it fell upon me…. When the light rested upon me I saw two Personages, whose brightness and glory defy all description, standing above me in the air” (JS-H 1:15-16).”On a sudden a light like that of day, only of a far purer and more glorious appearance and brightness, burst into the room. Indeed the first sight was as though the house was filled with consuming fire. The appearance produced a shock that affected the whole body. In a moment a personage stood before me, surrounded with a glory yet greater than that with which I was already surrounded” (Smith 439) . Introductory Word “He saw and heard much” (1 Nephi 1:6) “One of them spake unto me, calling me by name and said, pointing to the other—This is My Beloved Son. Hear Him!… I asked the Personages who stood above me in the light, which of all the sects was right… I was answered that I must join none of them, for they were all wrong” (JS-H 1:17-19).The angel, “called me by name, and said unto me that he was a messenger sent from the presence of God to me, and that his name was Moroni; that God had a work for me to do; and that my name should be had for good and evil among all nations, kindreds, and tongues, or that it should be both good and evil spoken of among all people” (JS-H 1:33) and that “I was chosen to be an instrument in the hands of God to bring about some of His purposes in this glorious dispensation” (Smith 439). Reaction “And because of the things which he saw and heard he did quake and tramble exceedingly. And it came to pass that he returned to his own house at Jerusalem; and he cast himself upon his bed, being overcome with the Spirit and the things which he had seen” (1 Nephi 1:6-7). “During the space of time which intervened between the time I had the vision and the year eighteen hundred and twenty-three… I frequently fell into many foolish errors, and displayed the weakness of youth, and the foibles of human nature… not consistent with that character which ought to be maintained by one who was called of God as I had been…. In consequence of these things, I often felt condemned for my weakness and imperfections… [and] I betook myself to prayer and supplication to Almighty God for forgiveness of all my sins and follies” (JS-H 1:28-29). Commission Later on, “the Lord spake unto my father… and said unto him: Blessed art thou Lehi, because… thous hast been faithful and declared unto this people the things which I commanded thee” (1 Nephi 2:1). “He called me by name, and said unto me that… God had a work for me to do; and… there was a book deposited, writted upon gold plates” (JS-H 1:33-34). Reassurance “And it came to pass that when my father had read and seen many great and marvelous things, he did exclaim many things unto the Lord; such as… because thou art merciful, thou wilt not suffer those who come unto thee that they shall perish!” (1 Nephi 1:14). Joseph was informed that God had forgiven his sins (see Smith 57). Moroni also informed Joseph that there were seer stones that “God had prepared… for the purpose of translating the book” stored along with the gold plates (JS-H 1:35). Conclusion “After the Lord had shown so many marvelous things unto my father, Lehi, yea, concerning the destruction of Jerusalem, behold he went forth among the people, and began to prophesy and to declare unto them concerning the things which he had both seen and heard” (1 Nephi 1:18). “I left the field, and went to the place where the messenger had told me the plates were deposited” (JS-H 1:50). 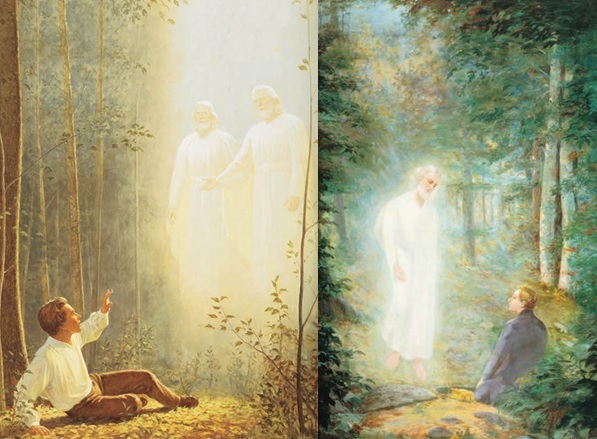 The First Vision did serve an important part of Joseph Smith’s prophetic call, but must be placed together with the visit of the Angel Moroni for a complete picture of the Prophet’s commission. Ballard, M. Russell. Our Search for Happiness. Salt Lake City: Church of Jesus Christ of Latter-day Saints, 2006. Harper, Steven and Brent L. Topp. “Historical Accounts of the First Vision.” Past Impressions. The Mormon Channel. Web. 22 May 2013. Jessee, Dean C. “The Early Accounts of Joseph Smith’s First Vision.” BYU Studies Vol. 9, no. 3 (1969). Jones, Christopher C. “The Power and Form of Godliness: Methodist Conversion Narratives and Joseph Smith’s First Vision.” Journal of Mormon History Vol. 37, No. 2 (2011), 88-114. Form-Critical Analysis.” BYU Studies 26 (Fall 1986), 67-95. Ricks, Stephen D. “The Narrative Call Pattern in the Prophetic Commission of Enoch.” BYU Studies, 97-105. Smith, Joseph. Teachings of the Presidents of the Church: Joseph Smith. Salt Lake City: Church of Jesus Christ of Latter-day Saints, 2007.